Making my weekly rounds of encased-meat industry group websites, I stumbled across the National Hot Dog And Sausage Council’s commandments for hot dog eating. Timely, I thought, as spring marks the arrival of peak hot dog season; let’s see what the sausage sages have to say. Unfortunately, some of the experts’ rules for eating hot dogs are off-base. For example, the council says: “Don’t bring wine to a hot dog barbecue. Beer, soda, lemonade and iced tea are preferable.” Yeah, beer and brats are a classic pairing, but what if I like Champagne with my all-beef frank? Don’t tell me how to live, sausage council. Furthermore, “Don’t take more than five bites to finish a hot dog. 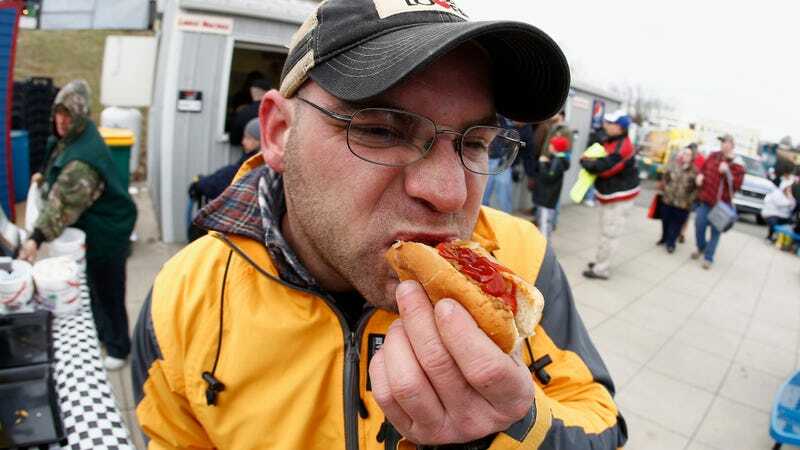 For foot-long wiener, seven bites are acceptable.” Aren’t hot dogs a top choking hazard? It seems unwise to recommend large gulps of a food practically synonymous with the Heimlich Maneuver. The Takeout says: Please consume your hot dog in however many bites you’d like. The council further recommends paper plates as the preferred serving vessel for hot dogs, but have they not known the tragedy of a floppy paper plate that folds under the weight of two hot dogs, sending your perfectly dressed dog tumbling to a dirty lawn? If sturdier plates can prevent such a calamity, we’re all for it. Giving credit where credit is due, though, the National Hot Dog And Sausage Council gets a few things right: “Don’t put hot dog toppings between the hot dog and the bun. Always ‘dress the dog,’ not the bun.” Wise words. I dislike it when the side of a bun absorbs all the condiments, leaving the other half of the dog—the dark side of the moon, if you will—naked and sauceless. A perfect stripe of mustard right down the middle is a beautiful sight. Think you know better than the Hot Dog Council? You can prove it with their Sausage Quiz, which hopefully comes with some type of certificate suitable for framing in one’s office.